The top five AGDAILY stories of the week … did you follow the action? This week we feature an inspiring young Vermont farmer, firefighter, and FFA’er; Before the Plate gives us a sneak peak of their film; and the Farm Babe proves you can’t judge a book by its cover. 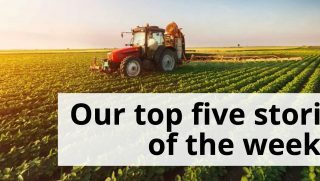 Don’t miss a moment at AGDAILY. Sign up and push your passion for agriculture further! Six farm families were recognized for not only being some of the nation’s best cattle and livestock operations, but also for their stewardship and conservation efforts during the 2017 Cattle Industry Summer Business Meeting last week. This year’s Environmental Stewardship regional winners will compete for the national award, which will be announced during the Annual Cattle Industry Convention in Phoenix, Arizona, in February 2018. This year’s regional winners include: Blue Lake Farm, LLC, operated by Rusty and Jessie Thomson, Sharon, South Carolina; SFI, Inc., Seth and Etta Smith, Nemaha, Iowa; Sterling Cattle Company, Jimmy and Theresa Sterling, Coahoma, Texas; Flying Diamond Ranch, Scott and Jean Johnson, Kit Carson, Colorado; Jim O’Haco Cattle Company, Jim and Jeanni O’Haco, Winslow, Arizona; and Munson Angus Farms, LLC, Chuck and Deanna Munson, Junction City, Kansas. Established in 1991 by the National Cattlemen’s Beef Association to recognize outstanding land stewards in the cattle industry, the Environmental Stewardship Award Program is generously sponsored by Dow AgroSciences, USDA Natural Resources Conservation Service (NRCS), U.S. Fish and Wildlife Service, and the National Cattlemen’s Foundation. 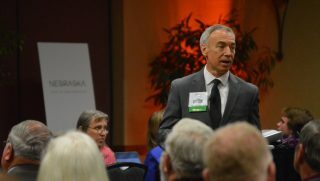 National Cattlemen’s Beef Association President Craig Uden echoed the sentiments of Owens, explaining that cattlemen and women across the nation take their commitment to the land, air, and water resources in their care very seriously. The AGDAILY Digest delivers the most interesting and engaging farming news right to your fingertips. “Feed Yard Foodie” blogger and cattlewoman Anne Burkholder has been selected for the National Cattlemen’s Beef Assocation inaugural Advocate of the Year award. 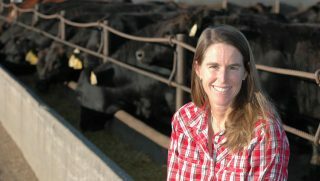 Burkholder’s passion for communicating with consumers led her to become an early graduate of the Masters of Beef Advocacy (MBA) program. She has taken that training, paired with her firsthand experience, to another level over the years partnering with the beef checkoff as a spokesperson. 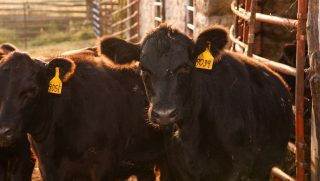 She has participated in national media interviews and high-profile panel discussions to share beef’s positive story with consumers around the country. “Feed Yard Foodie is a natural extension of me — It is an “Anne Gate” that creates appropriate transparency as I try to bridge the seemingly unending chasm between urban and rural America. I truly believe that ‘together we are stronger’ and my advocacy efforts focus on finding common ground with those that were not granted the blessing of living on a farm,” said Burkholder. Burkholder is no stranger to awards. She was awarded the BEEF Magazine Trailblazer award in 2014, she was named to Vance Publishing’s 40 under 40 in agriculture in 2013, and in 2009, she was awarded the Beef Quality Assurance Producer of the Year award.